Sarah LaFave (center) is joined by Lori's Hands officers Elizabeth Bonomo (left) and Jennifer McCord at the Jefferson Awards gala in Washington, D.C.
Sarah LaFave at the Jefferson Awards gala in Washington, D.C.
Jefferson Awards founder Sam Beard addresses the audience at the Jefferson Awards gala in Washington, D.C.
12:33 p.m., June 27, 2011--For Sarah LaFave, a recent trip to Washington, D.C., ranked right up there with skydiving as one of the most awe-inspiring experiences of her life. 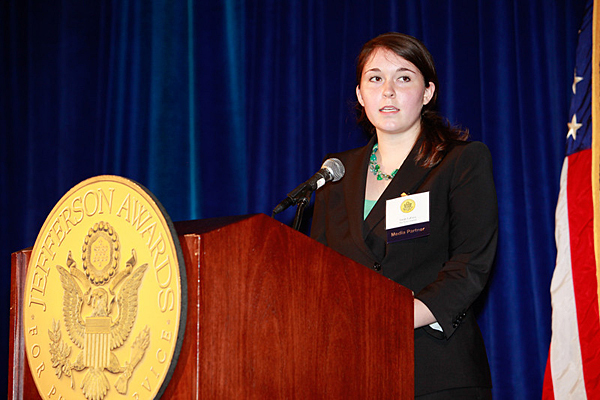 LaFave, an Honors Program student who earned her nursing degree at the University of Delaware in May, is the state recipient of a top 2011 Jefferson Award representing the best of Delaware volunteerism among almost 100 nominations. The recent graduate was recognized for her work in establishing and leading Lori’s Hands, a registered student organization at UD that offers assistance with household chores to elderly and chronically ill people in the Newark, Del., community. She started the organization in honor of her mother, who died of breast cancer in 2003. Joined by two other Lori’s Hands leaders, Elizabeth Bonomo and Jennifer McCord, LaFave traveled to the nation’s capital to receive her award at a gala on Tuesday, June 22. Beard, who lives in Greenville, Del., started his career as staff associate to the late U.S. Sen. Robert F. Kennedy in 1965. At a cocktail party a few years later, Jackie Kennedy Onassis asked him what he was thinking about. 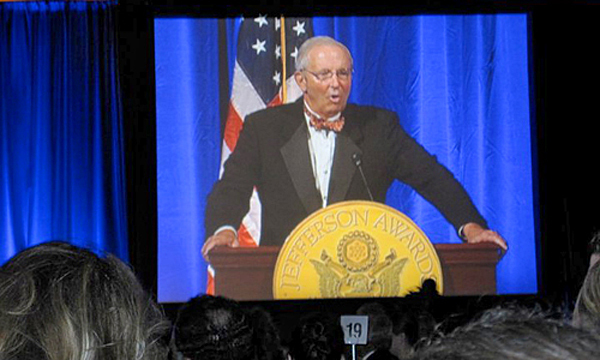 He told her that he thought there should be “a Nobel Prize for public service in America,” and the Jefferson Awards program was born. Beard’s dream was realized as the result of that accidental encounter with a former First Lady. Now, he may be able to “pay it forward” and help a young woman from the University of Delaware realize her own dream. 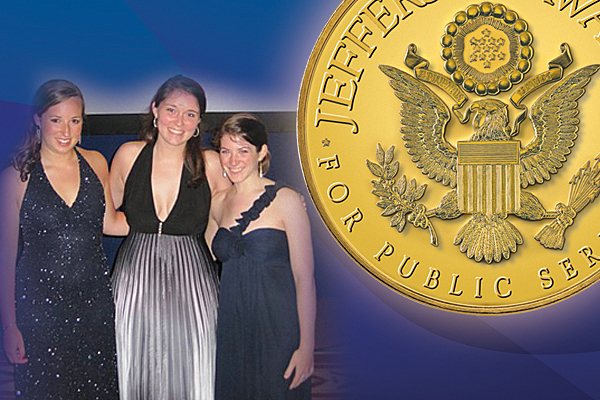 Co-founded by Sam Beard and Jackie Kennedy Onassis in 1969, the Jefferson Awards have grown into a “call for action” to multiply volunteering and community service in local communities and schools. In 1975, an early national ceremony was held under the dome in the U.S. Capitol building, with 60 people attending. Today, 155 television stations and newspapers work with the program to honor grassroots unsung heroes, and the program reaches more than 100 million Americans. Lori LaFave was an extraordinary mother whose active commitment to her community, and the elderly in particular, impacted and inspired those lucky enough to know her. She died in 2003 after an eight-year battle with breast cancer, but her compassion endures through Lori’s Hands. Her daughter Sarah LaFave founded the organization in her memory at the University of Delaware in 2009. Lori’s Hands volunteers serve elderly individuals and families affected by chronic illness. They assist their clients with housecleaning, yard work, grocery shopping and other activities of daily living. The organization connects energetic college students with local residents, fostering a positive cross-generational relationship between the campus and the surrounding community. For more information about Lori’s Hands, call 518-256-0298 or email contact@lorishands.org.